Let me count the ways I love thee, Liverpool Lil’s. This place, to me, provides a welcome glimpse into Old San Francisco. Walking in is like walking back in time. Those glimpses are fleeting in a town with so much change. How the place has managed to stay in business since 1973 is beyond me, a testament to her rock-solid place in the fabric of the City, I suppose. Every time I go back, typically punctuated by weeks or even months of not going, it’s exactly as I left it. Something really great about that. Local lore of a different sort suggests that Lil either didn’t actually exist, or that if she did, she might have been an, um, trollop. First use of the word “trollop” in the Lemonade Chronicles, so a little self-congratulatory pat on the back. I’ll take it. Sorry, Lil. First use of the word “heonce” in the Lemonade Chronicles, even if I’m quoting someone else who is a much better writer than I. I’ll take it. Sorry, Examiner writer. Something fascinating about the characters who have drank and presumably gotten drunk, on occasion, amidst these dark wood walls. And the intrigue doesn’t end with Joltin’ Joe. According to the San Francisco Chronicle, “This English pub-restaurant has been a favored haunt of classical and jazz musicians, [and even] the local FBI and Secret Service.” Hmm. OK, so that’s cool, but it also makes me a bit edgy, given my previously-stated discomfort with Google Search and TSA Gate Agents. My own personal history with Lil’s is far less fascinating, objectively speaking. I didn’t down Whiskey or Martinis with Mr. Coffee. My family did rent a flat for over 10 years from “The Crow” — Joe’s Yankee teammate, infielder Frank Crosetti. But he and I never shared an Anchor Steam at Lil’s. I have finished a number of long-ish trail runs, Tam road rides, and the like with a well-deserved pint or two, shared with a buddy or two who equally deserved their own pint or two. I also conceived a branded concert tour in cahoots with a colleague and friend who formerly ran marketing for Hard Rock. Cloistered away in a dark corner, lounging on red plastic-cushioned benches, underneath the photos of the aformentioned famous people who drank and presumably got drunk, on occasion, under their famous photos. So the place is special; think we’ve established that. Its walls are covered in a haphazard fashion, though sometimes I stumble on something truly unique. Like last night. Meeting a friend for a pint over a discussion of inflection points, I found behind my head a framed stock certificate. 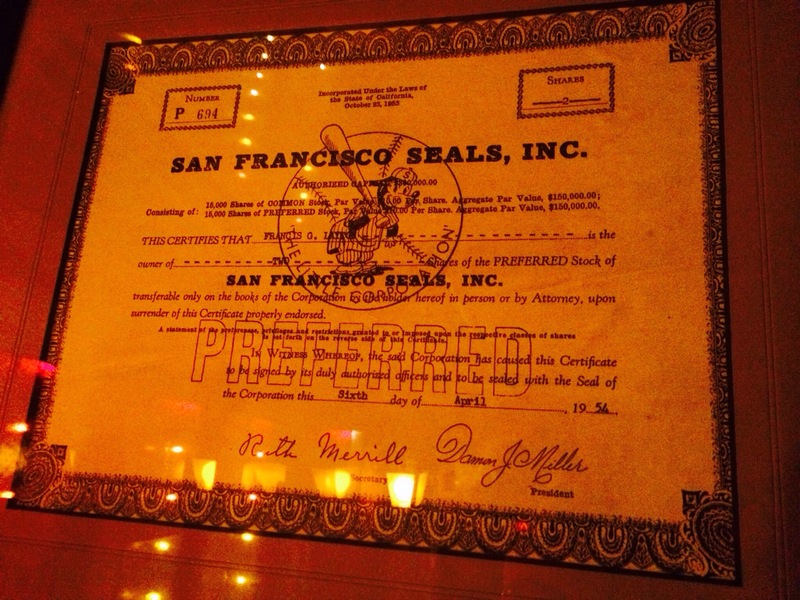 Someone had evidently purchased shares in San Francisco Seals, Inc., in 1956. Two shares, to be specific. The stockholder’s name is tough to make out, as you can see. Francis G. Someone. Leyag? Leyaf? Layae? I’ve Google searched every possible permutation of letters, and come up empty. And the Lil’s bartender who answered the phone tonight was none to happy about being pressed into duty to lean over a customer’s table and try to decipher Francis G’s last name in the dim light. I suppose that’s part of the charm. But I imagine the thrill that Francis G. stoked in his (her?) household the day he (she?) slapped that stock certificate on the kitchen table. Two shares in the franchise of Lefty O’Doul and the DiMaggios. History. Even at that time, it was clearly history-in-the-making. Must have been quite a thing. How it ended up on the wall at Liverpool Lil’s is a mystery. I would be surprised if anyone working there knows the stock certificate’s backstory, has any idea who Francis G. is or was. But I love the fact that it’s there. Oh, and one last thing: If you’re curious as to its value, I stumbled on a site offering a similar stock certificate for the bargain price of $895. ← The Big Red Button.